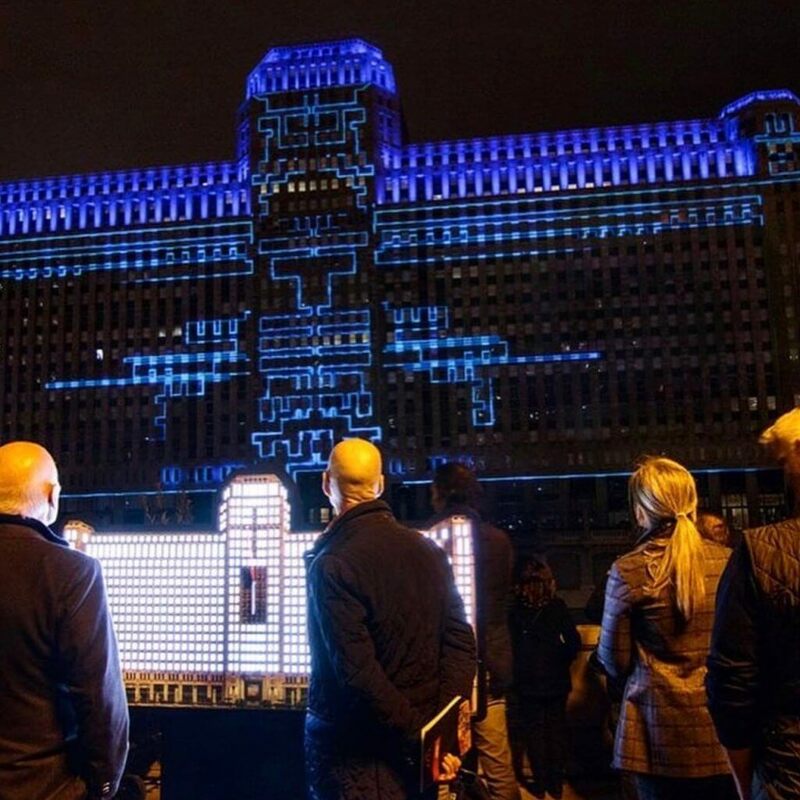 This past Saturday, Mayor Emanuel officially threw the switch to launch “Art on theMART,” a series of digital artwork projected across 2.5 acres of theMART’s exterior river-façade, creating the longest running and largest digital art projection in the world. Wacker Dr. between N. Wells St. and N. Orleans St. were closed off to traffic to enable public viewing of the projections. The program ran for approximately 35 minutes and culminated in a one-minute pyrotechnic display. Image Source: @artonthemart on Instagram. Needless to say, this was a high-profile event. 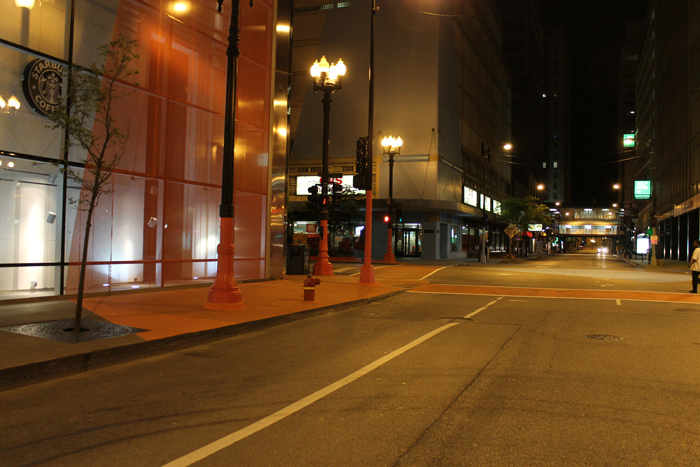 Thanks to our 20-year partnership with the Merchandise Mart, we were brought into assist. After two decades of working with us, theMART knows that when we commit to doing something that we will not let them down. It was an honor to be part of this project. To create a “buzz” and cover the construction zone, Creative Director Neil Huffman designed barricade wraps “teasing” the event. The wraps were works of art in themselves. 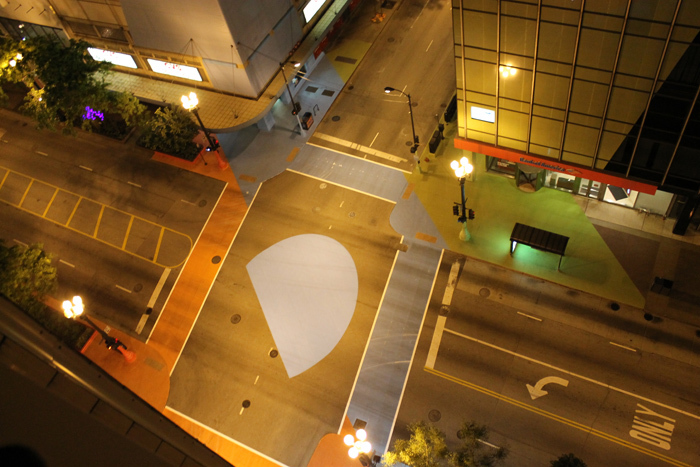 In fact, a street illustrator liked them so much they added their own touch to the graphics on Wacker Drive. As flattered as we were by the attention of a fellow artist, we felt our original effort was more in line with theMART’s mission and placed new panels over the graffiti. Sorry, friend! 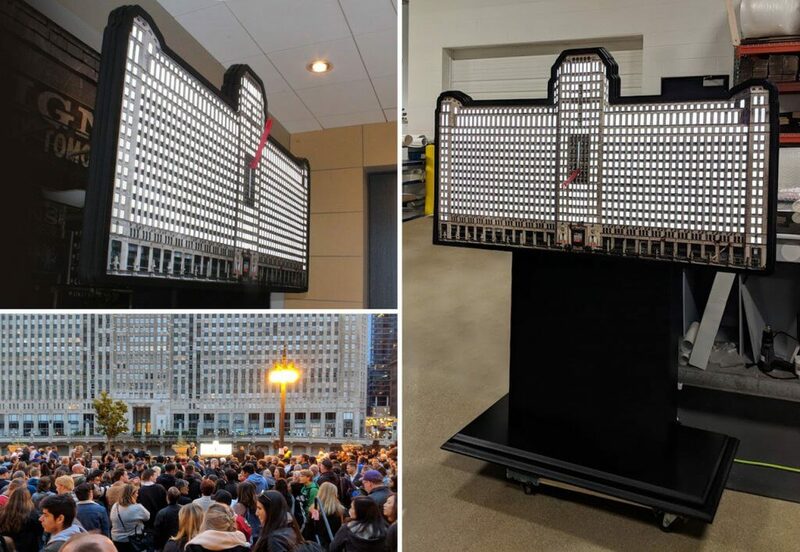 Over 30 projector arrays were used to turn the Merchandise Mart into one big video screen. We used our Multicam3000 CNC Router to produce the templates that were used to position the projectors in the proper positions for the perfect effect. A centerpiece of the opening ceremony was the switch the mayor pulled to start the show. We were approached to provide the prop about 3 weeks ago. We worked with the client for a few days to understand the project, Graphic Designer Alan Hinkhouse took a week for the design process and then Special Projects Manager Scott Studt had to make the entire display in only one week! A challenge, indeed. But a challenge we were excited to take on! This single aspect of the event involved expertise in creative design, dimensional design and fabrication, routing, painting, printing and lamination. 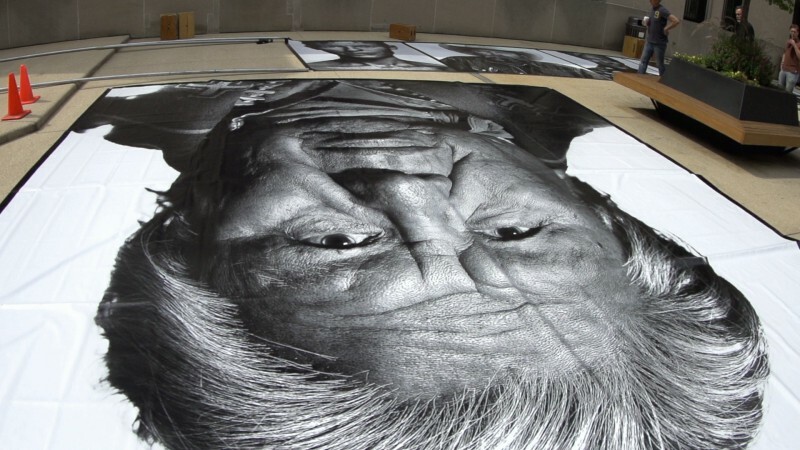 The City of Chicago and theMART will work in partnership to manage and curate the projected artwork over the course of a 30-year agreement.If you missed the opening ceremonies, the projections will be displayed up to two hours nightly from Wednesday to Sunday and every month except January and February. 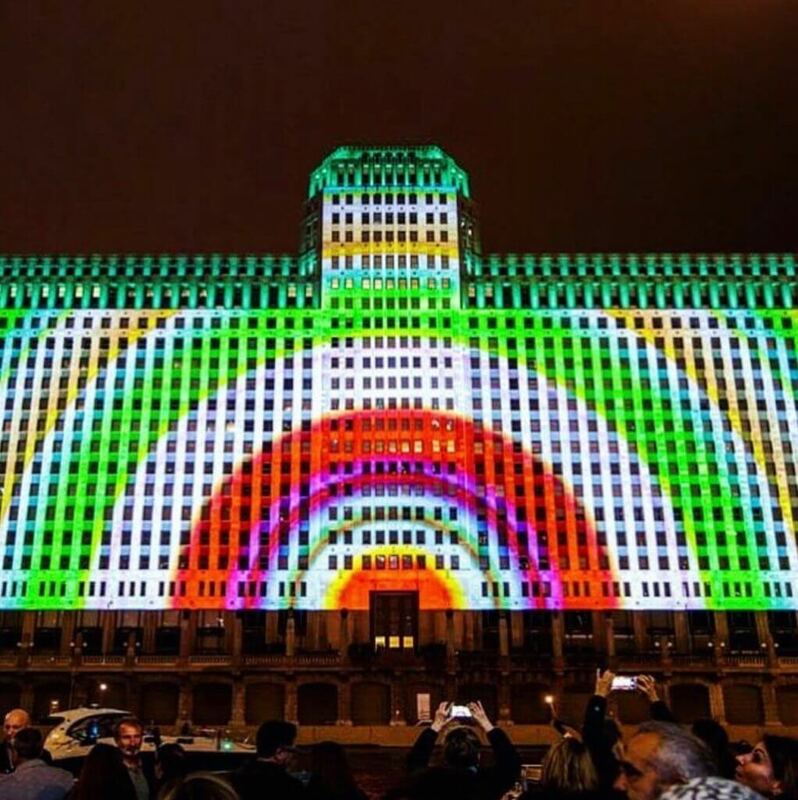 Even if you’re not lighting up one of Chicago’s iconic buildings, we can help you with your large-format graphic needs. Please contact us and let us know what we can do for you.